Can't repair the windscreen of your Saab anymore? A windscreen replacement of a Saab 90 or 99 starts with a problem. There are no more Saab 90 windscreens in stock. The Saab 99 windscreens also need to be specially made. It is difficult to find parts for these models. This is not very strange: both models have had a lot of criticism to deal with. For example, the Saab 90 was made to compete with the Volvo 340, but a strange construction was chosen. According to critics Saab still had parts left of the Saab 900 and 99 and the Saab 90 was built from them. At the same time, both the Saab 90 and the Saab 99 have become classics and are increasingly difficult to find. This has also made it more difficult to obtain replacement parts for these models. In short, there is one big difference between the Saab 90 and the Saab 99. 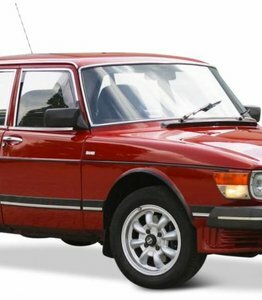 The Saab 90 has the front of the Saab 99 and the back of the Saab 900. As a result, it has become a remarkable car. In Sweden itself, the Saab 90 caused a lot of fuss among lovers of classic cars. It is a real Swedish classic of Saab, but was built in Finland by Valmet Automotive. The Saab 99 has also received some criticism: the engine in this model is made in England where different bolts are used than Saab normally used in the making of the engines. This still causes irritation among lovers of classic cars who want to tinker themselves. The Saab tool does not fit and the complete head has to be removed from the engine before there can be any real tinkering. The fact that the two models have so many similarities also has a great advantage. Especially when you look at the windscreen replacement of both models. A Saab 90 windscreen is identical to a Saab 99 windscreen. This is not very surprising. Most of the fronts of both cars are identical. Since the windscreens of a Saab 90/99 are the same size, they are interchangeable. The disadvantage is that Saab 90 and Saab 99 automotive glass is no longer in stock and have to be made to order. Approximately 25,000 copies of the Saab 90 were made between 1984 and 1987. Of these, 10,000 copies were reserved for the Swedish market. In the 90s Saab managed to beat the sales figures of both Alfa Romeo and Audi with this model. Approximately 10% of the Saab 90 models can still be found in traffic. The Saab 99 has its own special story. This model was released with the slogan 'a Swede with broad shoulders'. The reason for this was that Saab had shortened the 99 by making it shorter than all the models of its competitors. In order to make the 'limited' 4.35 metres forget, a lot of emphasis was placed on how wide the car was. During the sixteen years in which this model was produced, literally everything was adapted by the engineers. The brakes, the cooling system, the heating, the clutch, the front suspension and the suspension. Everything has changed, except for the Saab 99 windscreen. There are 588,643 copies made of the Saab 99. However, it is not clear how many are still present in the traffic. There are not many copies of the Saab 90 or Saab 99 anymore that are used daily. Both models are considered to be classics and many car parts are (unfortunately) no longer made. Whereas for certain models it is worthwhile to go to the country of the manufacturer, for the Saab 90 and Saab 99 models this is not a good idea. In Scandinavia too, spare parts are scarce, all the more so because the cars were used as winter cars. The salt on the roads causes faster and heavier wear on the parts. This also applies to the Saab 90 windscreen and of course the Saab 99 windscreen. Most of these car windows were made in Finland, in the factory where the cars were also made. However, the Saab 90 and 99 windscreens are no longer made here. On the after market there is no automotive glass for the Saab 90 and 99 more to be found. These have to be specially custom made. We can arrange this directly for you. The delivery time is 20 weeks. A car window repair of this classic requires therefore a lot of patience. Do you want to do the windscreen replacement of a Saab 90 or Saab 99 yourself? How to replace a car window? A Saab 90 windscreen replacement is equivalent to replacing a Saab 99 windscreen. They are the same windscreens and the assembly is done in the same way. You will, of course, start by disassembling the old windscreen. In most cases, this is done by using a thin square cutting wire to pass through the glue. It is recommended to use safety goggles at the windscreen replacement of a Saab 90 or 99. Old glue, rust and other small particles can jump out due to the force. With a glued windscreen of a Saab 90 or Saab 99, the windscreen is a bearing part of the body; it largely determines the stiffness of the car. Since the Saab 90 and Saab have 99 airbags, it is important that the new windscreen is properly glued. If this does not happen, the airbag will cause more damage in the event of a collision. It is certainly possible to do the windscreen replacement of the Saab 90 or Saab 99 yourself if you have enough space. A dry and spacious workplace is required and it is necessary to have a second person near when installing the new car window. Not only because of the weight of the windscreen, but also because of the size of a Saab 90 or Saab 99 windscreen. A new Saab 90/99 windscreen. Saab 90/99 windscreen: Are you insured? In most cases it is wise to include the insurance. Did the car window damage occur during the term of the insurance? When you have a car insurance with more than just a third-party cover, the chances are that the insurance will cover (part of) the costs. You can find more information about this in your car insurer's policy. If you only have the legally required third-party insurance, it is very unlikely that the insurer will cover the costs of the windscreen replacement of the Saab 90/99. Even if you have to have the Saab rear window replaced, or the side windows, you can not go to the insurer for this. The third-party insurance does not cover damage to your own car. There are several ways to reduce the cost of a new windscreen. For instance, you can choose an after market windscreen for the Saab 90 or 99. Because these are not in stock, you will need to be patient: the average delivery time is 20 weeks. Do you not want to install the new windscreen for your Saab yourself? Then we will immediately arrange one of our very experienced partners for the assembly of the new Saab windscreen.